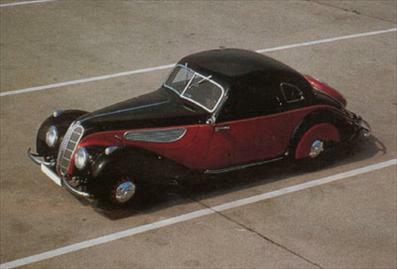 The swank bmw 327 was a teutonic beauty a streamlined adornment for the salad days of the third reich. When the advanced engine of the sporting 328 was installed, the model became the 327328. Only 569 of these high-priced two-seat coupes and convertibles were made before world war ii put an end to production. Nearly 500 were convertibles. Top speed of about 87 mph engine typedrivetrain: Overhead-valve, in-line 6 displacement 1,971 cc power rating 80 hp transmission 4-speed, all-synchronized chassis: Semielliptic rear springs; Hydraulic drum brakes; 2,535 lbs. Sleek two-toned body the bmw 327 frame was a shortened version of the 326, with the wheelbase reduced a half ft. To 108 in. The body, designed by peter schimanoffsky, was based on the famous (but commercially unsuccessful) chrysler airflow. It featured two colors, faired-in front fenders, side hood vents, semiskirted rear wheels and a metal-encased spare tire on the trunk. powerful hemi engine customers wanted more performance than they could get from the 327s 55hp six-cylinder engine, so bmw gave the model the 80hp version of the 328, which was one of the finest sports cars ever made. The ingenious design of this engine gave it most of the advantages of twin camshafts, but with only one it was simpler and cheaper to make. The use of hemispheric cylinder heads gave the engine an unusually high compression ratio. Performance was also enhanced by three downdraft carburetors.